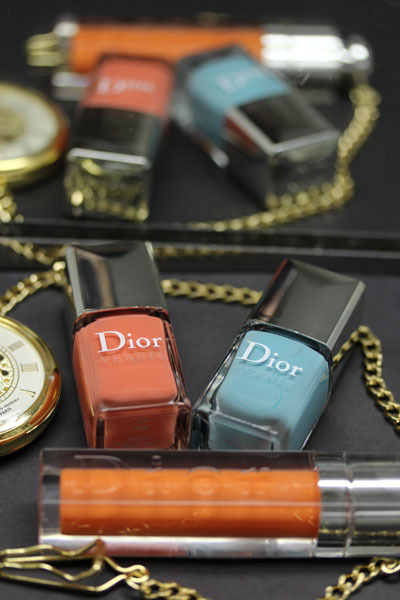 The stars of the Dior Summer 2012 Croisette Collection are the two nail polishes, hands down. While making dinner yesterday, I actually stared at my fingers and thought, if I had to live with only one polish collection this summer I could do it with Dior. this was how my manicure looked five days in. Also, do you like my dotted french manicure? I wore Bikini twice consecutively last week, which never happens, and I'm not just saying it. I am so thankful Dior decided to rerelease St. Tropez this summer. The polish first cane out some time last year in very limited amounts. I wanted to order it (in fact, I was trying desperately for hours to) but something was wrong with the checkout cart, and by the time it was fixed the polish was already sold out. I was utterly devastated! I kept checking the website for days to see if they might have magically restored it. But now it's here, and I knew I was right being so desperate to own it almost a year ago. St. Tropez is the light teal-blue of my dreams, and that's saying something considering the amount of blues I've been seeing lately. Again, I apologize for having to do this, but I prefer giving you an accurate version of how the color actually looks in real life. I don't know why my camera is doing this! 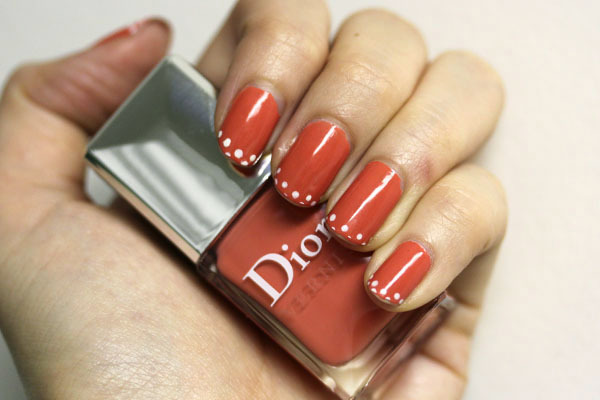 Dior is heading toward a stellar direction as far as its nail polishes are concerned. The formula seems to get better with every release (these two were so smooth I actually had fun painting my nails) and I am now convinced that the tapered Dior brush is the greatest thing to happen to at-home manicures. Everytime I paint my nails with a Dior polish it turns out (dare I say?) professional looking and I get all happy inside because it's pretty and it'll stay that way for a long time. I remove my Dior manicures not because of chipping but because my nails have grown out. 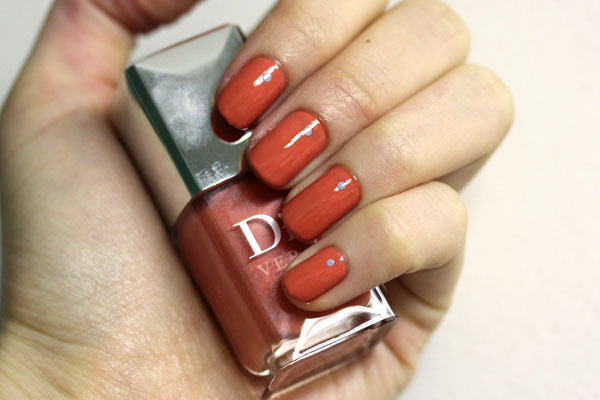 Dior Vernis Bikini and St. Tropez retails for $23 and should be available at Dior counters nationwide. I foresee these selling out really quickly, so don't take too long to decide if you want them! Ooo these are pretty, though I suspect St. Tropez wouldn't work for my skintone. I love your dotted manicure! It's really cute! And yeah, I agree with you about Dior brushes. They've got to be hands down the easiest I've ever used! omg I totally need Bikini!!! I bought St. Tropez, too, because I missed out on it last year and I was not going to do that again. I skipped Bikini because...I have colors that are similar, I think. I think these might be my FIRST Dior polishes! These are both gorgeous shades! I think Dior nailed it with these. Love the dotted french manicure. It's very classy yet fun! 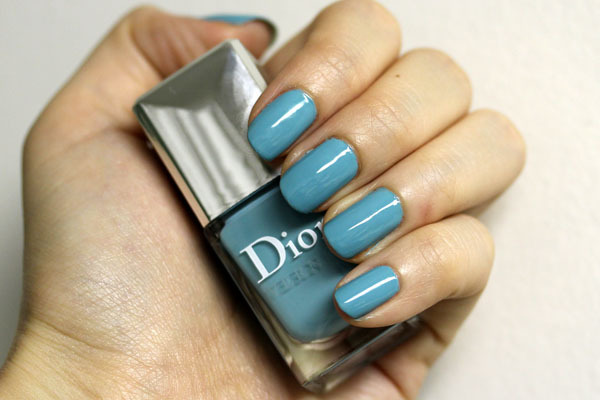 I had not paid attention to Dior's nail polish until this year's release of Waterlily. Their formula is so amazing, lasting way longer on my nails than Chanel. I've bought St. Tropez this year as well. Had to skip Bikini for now since I've already had a similar color. Love, love, love! I'll definitely keeping an eye out for those polishes when I go through Changi next week! Claire- :) summer polishes are easy to love! Paige- thank you :D and yes, I've largely stopped buying Chanel by now. I find that their items do not live up to the quality that I would expect from that price. Lovely colours! I cant decide between bikini and st tropez! I guess I go with the blue one because I have soo many redish orangy peachy shades.. I just tried to follow your blog 3 times! and it didn´t work! Is there possibly a new kind of virus among bloggers? (my blog stagnates on followers also there are these weird link-viruses that visite my blog regularly..